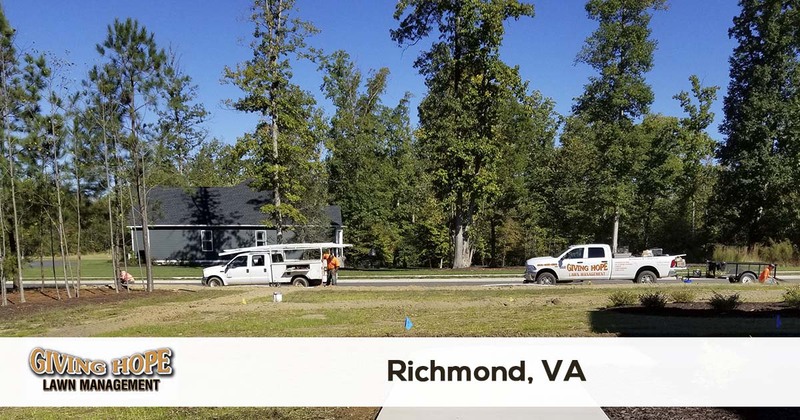 Giving Hope Lawn Management is proud to serve the community of Richmond with professional lawn care and landscaping services. For more information or to get a free quote call us today at 804-839-8340. The capital of Richmond, VA, is known for its lush natural surroundings. Why its nickname is even the River City! But all that water and greenery needs quality Richmond lawn care. How can you find the right landscaping services for your home or office? Since 2011, Giving Hope Lawn Management continues to help more residents achieve their perfect yard. We handle all your landscaping needs, from new yard installations to irrigation systems services. Whether you need a better choice in monthly yard care maintenance or you just need to know you’re getting the best quality possible, we are always here for you! Call today to learn how we can save you more on all your landscaping services. When other companies only offer a couple of landscaping options, we pride ourselves on remaining a full-service lawn care business. From new construction preparation to complete yard renovations, we do it all for less! By hiring the same company for all your yard care needs, it gives you consistent quality and better overall growth. There’s no need to continue spending a fortune on several companies for your lawns! No matter what your result or desired yard appearance is, we can help you achieve your ideal lawn. Choose the team more residents trust their yards to each time! If you’re sick of lawn care companies that don’t get results, then it’s time to call the top name in complete landscaping services. Call us today and start enjoying your best lawns! Giving Hope Lawn Management is the industry leader for lawn care and landscaping in Richmond. We offer a 100% satisfaction guarantee with all of our services, so there is no risk for you to give us a try. Give us a call today for the fastest service at 804-839-8340.